Ground your hazelnuts in your blender. Leave them grainy (not a nut butter!). Take the ground hazelnuts out of the blender and into a bowl. Mix the melted coconut butter with pitted dates. Put the nut mix, date mix and everything else into your bowl and mix with your hands. Place the baking sheet in your pyrex. Press and evenly distribute the yumminess into it. 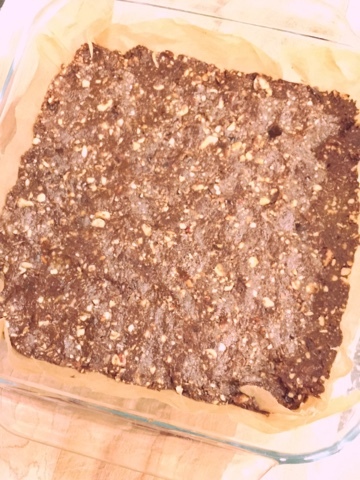 Refrigerate for 20 minutes, then cut into squares and enjoy!